One convenient use of R is to provide a comprehensive set of statistical tables. Functions are provided to evaluate the cumulative distribution function P(X <= x), the probability density function and the quantile function (given q, the smallest x such that P(X <= x) > q), and to simulate from the distribution. Prefix the name given here by ‘d’ for the density, ‘p’ for the CDF, ‘q’ for the quantile function and ‘r’ for simulation (random deviates). The first argument is x for dxxx, q for pxxx, p for qxxx and n for rxxx (except for rhyper, rsignrank and rwilcox, for which it is nn). In not quite all cases is the non-centrality parameter ncp currently available: see the on-line help for details. or more accurate log-likelihoods (by dxxx(…, log = TRUE)), directly. In addition there are functions ptukey and qtukey for the distribution of the studentized range of samples from a normal distribution, and dmultinom and rmultinom for the multinomial distribution. Further distributions are available in contributed packages, notably SuppDists. See the on-line help on RNG for how random-number generation is done in R.
Given a (univariate) set of data we can examine its distribution in a large number of ways. The simplest is to examine the numbers. Two slightly different summaries are given by summary and fivenum and a display of the numbers by stem (a “stem and leaf” plot). A stem-and-leaf plot is like a histogram, and R has a function hist to plot histograms. 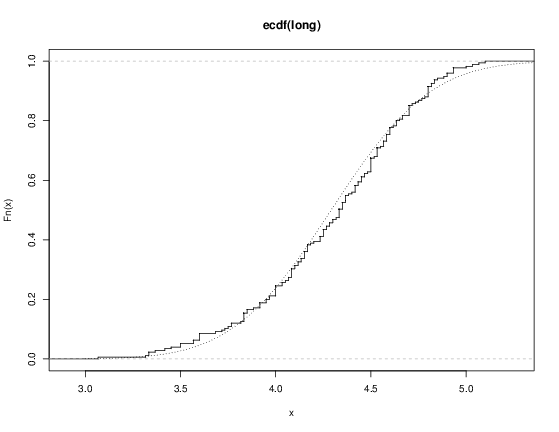 We can plot the empirical cumulative distribution function by using the function ecdf. This distribution is obviously far from any standard distribution. How about the right-hand mode, say eruptions of longer than 3 minutes? Let us fit a normal distribution and overlay the fitted CDF. 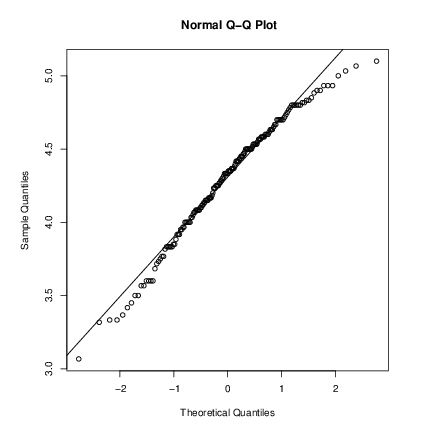 Quantile-quantile (Q-Q) plots can help us examine this more carefully. So far we have compared a single sample to a normal distribution. A much more common operation is to compare aspects of two samples. Note that in R, all “classical” tests including the ones used below are in package stats which is normally loaded. 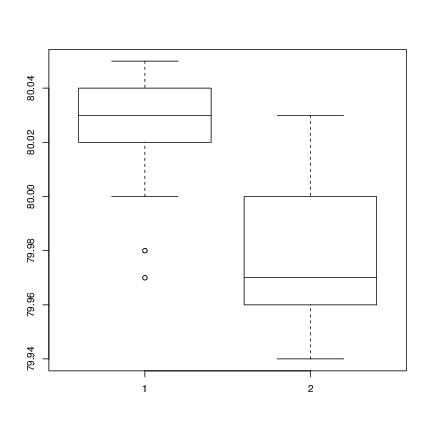 Boxplots provide a simple graphical comparison of the two samples. which indicates that the first group tends to give higher results than the second. which does indicate a significant difference, assuming normality. By default the R function does not assume equality of variances in the two samples (in contrast to the similar S-PLUS t.test function). We can use the F test to test for equality in the variances, provided that the two samples are from normal populations. which shows no evidence of a significant difference, and so we can use the classical t-test that assumes equality of the variances. All these tests assume normality of the two samples. 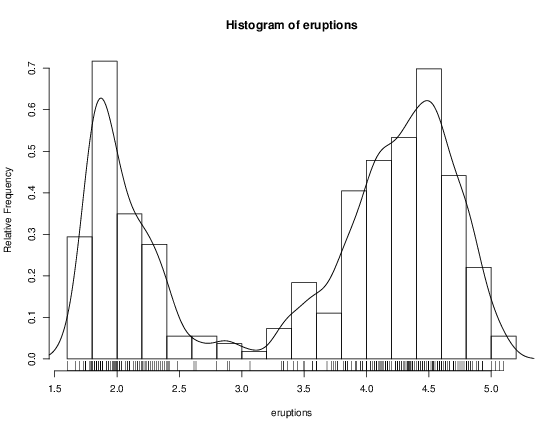 The two-sample Wilcoxon (or Mann-Whitney) test only assumes a common continuous distribution under the null hypothesis. Note the warning: there are several ties in each sample, which suggests strongly that these data are from a discrete distribution (probably due to rounding).